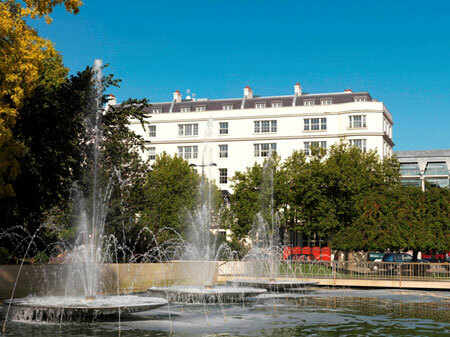 Four Connaught Place is the refurbishment of a classic landmark Grade II listed building near London’s Oxford Street – and the former HQ of Cadbury Schweppes – into 10 exceptional apartments. The architects, Lifschutz Davidson Sandilands, have worked to preserve the historic character of the building, while creating modern living spaces with practical contemporary layouts, maximising on space and light. The entire building is air conditioned by an energy-efficient ground source heating system. 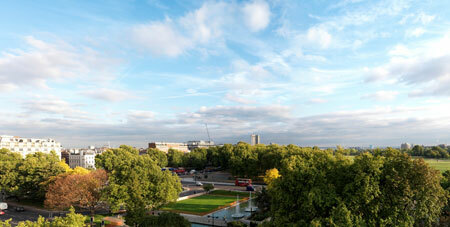 There are one, two and three bedroom apartments available with prices starting from £995,000. Some have patios and terraces, others balconies, some are split level, others lateral. Secure underground parking is available by separate negotiation. Cassandra Elliott continues: ‘The first floor apartment of the former grand Georgian building, features ornate cornicing and impressive high ceilings. As it would once have been used as a formal ballroom the listing and planning regulations have meant the interior walls could not be touched and the rooms could not be split, but creative design sympathetic to the original features has adapted it for modern living with the incorporation of sliding walls to section off part of the room as a guest bedroom area or study. A central island pod acts as a divide between the rooms and additionally incorporates kitchen and bathroom facilities.